A perfect refresher into the salient points of this needless conflict. I enjoyed this facinating read. I had no prior in dept knowledge of of the history of the Great War and this book educated me with concise and intersting facts. 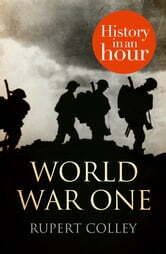 I liked the book, it gave all the basic facts of WW1. The time line of events at the back was excellent. A concise and informative history of this war including biographies of the leading figures on both sides of the conflict. Chockablock full of fascinating information, well written and a pleasure to read - but full of unnecessary typos that distract, irritate and even confuse. What a pity.